Zionsville Town Hall is located at 1100 West Oak Street, Zionsville, IN 46077; phone: 317-873-8245. Photo: Maplelawn Farmstead, ca. 1860, 9575 Whitestown Road, Zionsville, IN. Listed on the National Register of Historic Places in 2008. Photographed by User:Nyttend (own work), 2011, [cc0-by-1.0 (creativecommons.org/publicdomain/zero/1.0/deed.en], via Wikimedia Commons, accessed March, 2014. Zionsville was platted in 1852. It served as one railroad stop between Indianapolis and Lafayette and became a local trade center. Due to the railroad and productive farmland around the town, Zionsville grew quickly. 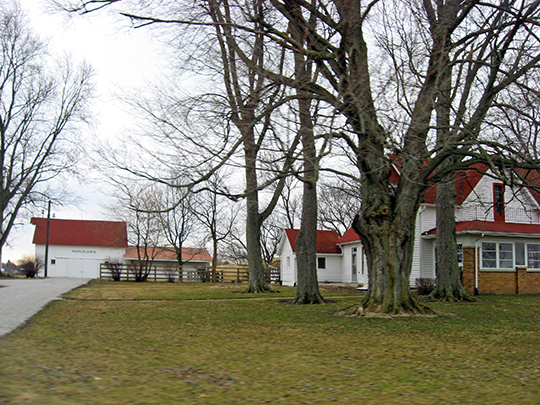 In the late 1800's, Zionsville became a unique cultural center in Boone County when Zion Park Assembly, Inc., a chautauqua-type organization, was founded on ten acres of land beyond the western town limits. Summer camp meetings, lasting approximately two weeks, were held annually until 1892 and included appearances by personalities such as Byron W. King, Albert J. Beveridge, and William Jennings Bryan. When vaudeville became popular in America, the original Zionsville Town Hall served as a theatre and became a regular stop on the vaudeville circuit. In 1903, the Northwestern Division of Terre Haute, Indianapolis, and Evansville Interurban began hourly service through Zionsville from Indianapolis to Lafayette. By 1910, the town's population had reached 840, and it became the second largest town in Boone County. By 1937, Zionsville's population was 1,300. Growth in the town remained stable in the 1940's and 1950's. In the late 1950's and 1960's, the town experienced a business revival led by private citizens and business leaders. The concept of creating a "quaint Colonial Village" was shepherded by the Greater Zionsville Chamber of Commerce in an effort to improve the identity and business atmosphere of the Town. The "Miracle on Main Street" was born. Many businesses chose a Colonial style facade for remodeling. By 1965, approximately half of the Town's business structures had been remodeled. The Town had received national and regional attention and Zionsville businesses were competing favorably with nearby Indianapolis shopping centers. Zionsville Town Council, 2010 Comprehensive Plan, www.zionsville-in.gov, accessed March, 2014.